Please push for a more ambitious share of Horizon Europe for Cluster 4 ‘Climate, Energy and Mobility’. Horizon Europe Rapporteurs and Shadows will hold their final meeting on Compromise Amendments on Thursday morning. The last chance for a compromise amendment on the breakdown of the budget of Horizon Europe that gives adequate resources to tackling climate change is rapidly approaching. The current proposal is to reduce the share of spending on Cluster 4 to a level less than the Commission’s original proposal. We believe that a more ambitious share would be necessary to make sure that European Union remains consistent with the energy efficiency and renewable energy targets adopted yesterday in the Clean Energy Package. – October’s IPCC report has shown that there are gains across society if global warming is limited to 1.5°C instead of 2°. Many sectors of the economy and areas of research can and should contribute, especially the areas covered by Cluster 4. 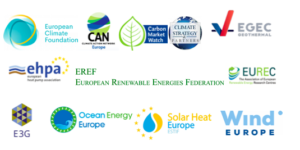 – The EC is soon to adopt a ‘Long Term Strategy’ towards a net-zero economy by 2050, a new development since the Commission adopted Horizon Europe, which will show the importance of innovation in climate, energy and mobility for the European economy. – A boost for climate-related work is consistent with the EP’s resolution on the MFF (climate mainstreaming increased from 25% to 30%) and demonstrates a willingness to lead ahead of COP24 and next year’s EP elections.